Ribs finishing on the grill. 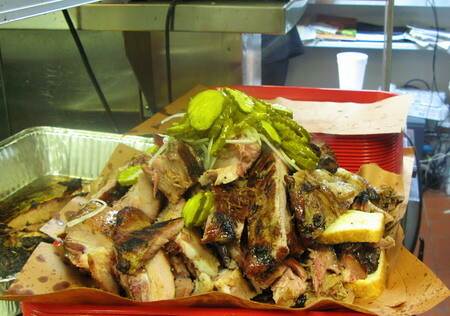 The jumbo “Garbage Plate” with everything on it — Ribs, Rib Tips, Pulled Pork, Chicken, Brisket, Sausage. 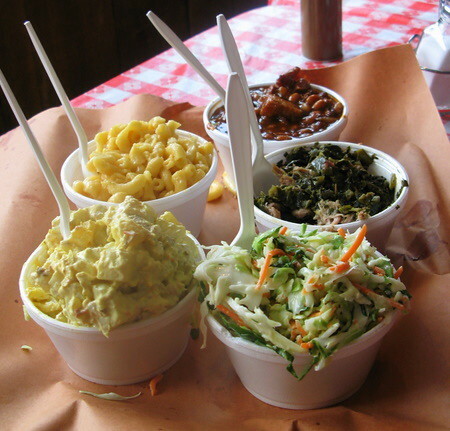 A medley of side dishes — Potato Salad, Coleslaw, Mac and Cheese, Greens, and BBQ Beans with meat debris. 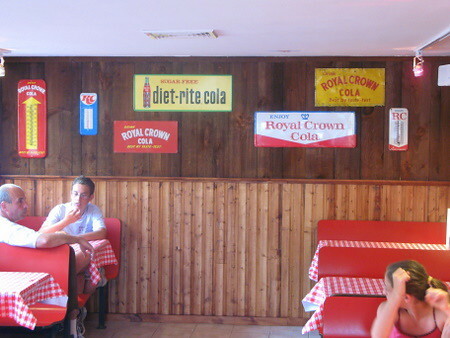 Bourbon BBQ was designed to look just like a dive BBQ place down South. This entry was posted on Wednesday, July 11th, 2007 at 12:04 am and is filed under Food, General, Media, New Jersey, Podcast. You can follow any responses to this entry through the RSS 2.0 feed. You can leave a response, or trackback from your own site. Checked out this place at their grand opening party. 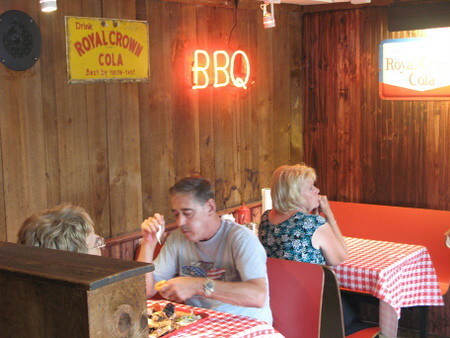 Certainly a good place to add to the neighborhood which really has been crying for more barbecue. I liked the brisket the best; I haven’t had the opportunity(or perhaps ability) to try the “Garbage Plate” but it certainly looks enticing. I want to give it anthor go soon. 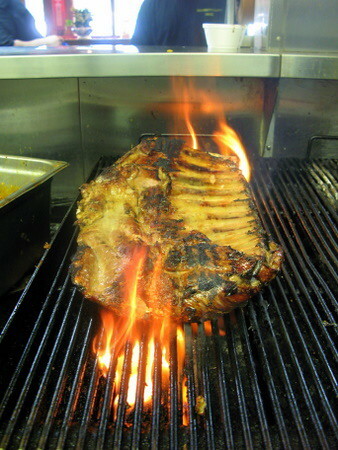 What do you think of the smoke on the meat? Give my regards to Rachel. In our order of what we liked best, I’m going to say the brisket, then the chicken, and then sausage, ribs, and pulled pork, I think the brisket has the smokiest flavor currently, the chicken is nice and juicy, sausage is moist and has a good smoky flavor. The ribs are juicy and tasty but are not as smoky as the other stuff (unless you count the rib tips which are quite smoky but not as juicy) same with the pulled pork. 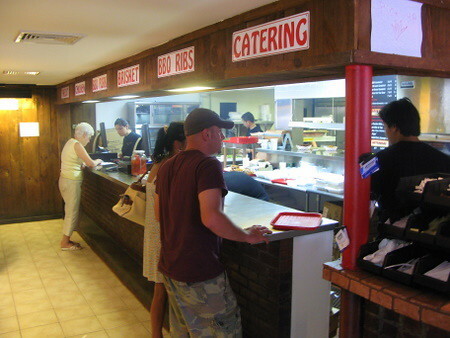 But I like everything there, its definitely excellent quality BBQ. 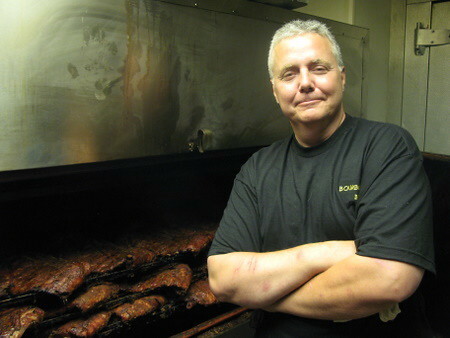 Gary uses Hickory wood more or less exclusively as his flavoring wood, which is definitely one of the gentler flavoring woods when used in smoking. It doesn’t have the punch of Mesquite or Oak. However you can smoke a lot longer with it and use more of it without worrying about the taste going bitter or acrid in the meat, and it doesn’t overpower the natural flavor of the meat either. So that’s something to consider when evaluating his Q. Tried to go Sat nite 8:15 pm, out of food we were told. I guess I’m going to have to let them get their act together. Hahahahah, that’s great. One of the most unpretentious names for a foodstuff that I’ve ever come across. I wish I had a place like this near to me. Just a quick note to let you know that I am a HUGE fan of your place.